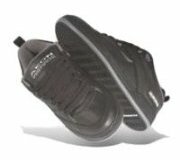 Ardea Shoes were originally designed for skateboarders seeking stability and great board feeling. The Shoe Ardea has been manufacturing since 2002, and its popularity has never declined since. Shoe's last: AE#01 - the biggest of the Aeon range; the best on board stability. Shoe's sole: Cupsole type flex and ground contact. Shoe's upper Features: Triple stitched reinforcing toe area. Rubber underlay on the ollie area. Hidden pocket. Lace saving system on the ollie area. Elastic tongue straps absorbing insole. Shoe's sole Features: 400 NBS rubber outsole. Inserted EVA midsole. Dual density EVA footbed.